Blog - by Nick D'Alessio. Girdwood, Alaska and Beyond! Trip Reports and Photos from Personal and Guided Backcountry Adventures. It's busy season - Months of hard work in the office pay off when I get to spend most of my days out enjoying time in the mountains with the people I talk with on email and phone - and that's why I do it. It's been a great season so far meeting people from around the world. Oh and the skiing has been pretty damn good too!! Computer screens filled with email threads, spreadsheets, land permits, insurance plans blah blah blah... turn into mountain views and powder face shots! Current Availability (as of March 4th): I am booked up through April 17th. Although I do have two available weekends for heli-skiing or backcountry touring on the weekends of March 24-25, March 31-April 1 and mid-week April 10-11. But don't be afraid to be in touch, things can change, trips can cancel. Beginning April 18th I have availability through June. 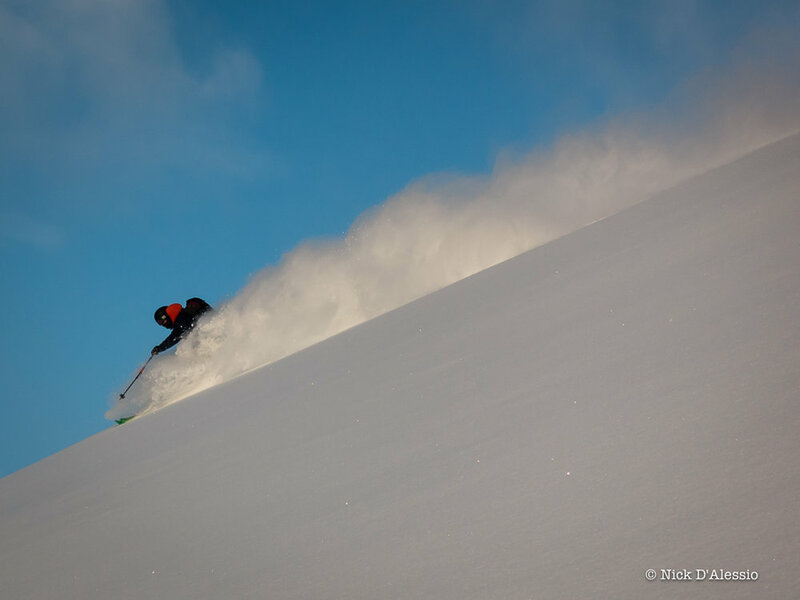 Skiing in May is particularly one of my favorite months for ski trips in Alaska. Within those time frames I have had lots of interest but with no official bookings yet. If you are serious about doing a trip with me be in touch soon and lets make it happen - I would love to ski or ride with you! Two years ago I wrote an article for The Avalanche Review publication that appeared in the September 2016 issue. See here for the original article I wrote about a new way of doing an effective beacon check. It works really well and does not let you skip potentially life saving steps before you leave the trail head, which I see happen way too often. This year - thanks to Eeva Latosuo (Alaska Pacific University and Alaska Avalanche School) The D'BEST beacon check has evolved to D'BEAST. The 'A' is for "Airbag or Avalung". Is your Avalung out? If you or anyone in your group uses an airbag backpack you want to make sure you check that the handle is out, and turned on if using the JetForce technology. If you are going to spend a bunch of money and carry the extra weight of an airbag pack but do not have the handle out, it's basically worthless. Lastly, make sure the leader switches back to transmit and stowed away properly. Using this acronym is an easy way to ensure you do not skip important steps to start your day skiing, snowboarding, snowmobiling (aka snowmachine in Alaska) or other mountain travel. I use it every single day I go out whether teaching avalanche courses, backcountry ski tour guiding, heli-ski guiding or just out with friends on a personal day. Let D'BEAST be your way of doing a beacon check too. Copyright © 2015-2019 Remarkable Adventures LLC. All Rights Reserved.